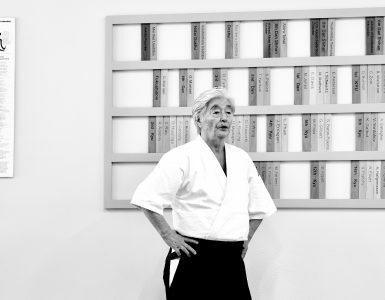 Top Yoshinkan instructor recalls episodes of the youthful Gozo Shioda and his master Morihei Ueshiba, the early days of the Yoshinkan dojo and expounds on the fine points of teaching aikido to policewomen. Aiki News: About when did you begin your practice of aikido, Sensei? Inoue Sensei: I began to practice on November 1, 1955 while a junior at the university. At that time aikido was not known at all. I was also studying at the Logos English language school in Mejiro as I wished to become a diplomat. One of my classmates was a seaman who was practicing aikido. When I asked him what aikido was, he twisted my wrist applying what we call “nikajo”. I found it interesting and asked him to get me a brochure from the Yoshinkan. I told Mr. Kushida, who is now instructing in the United States, about the school and we immediately went to visit the dojo in Tsukudo Hachiman. Mr. Kushida and I went to the same junior high school, high school and university. We would always practice together in the beginning. We attended only the class where the roll was called and would practice aikido at the dojo from morning till night. Who were the seniors students in those days? Terada Sensei, Matsuo Sensei and Tanaka Sensei of the Shiseikan Dojo of the Meiji Shrine were instructing then. Did Tenryu, the Sumo wrestler often go to the Yoshinkan at that time? Was there any relationship between the Ueshiba Dojo and the Yoshinkan at that time? Yes. Shioda Sensei would often go to Aikikai demonstrations. I accompanied him very often, Aikikai teachers were invited to Yoshinkan demonstrations too. However, we didn’t perform in their demonstrations nor did they in ours. Ueshiba Sensei never visted the Yoshinkan. Once at the Aikikai demonstration held in the Hibiya hall, Mr. Kushida and I accompanied Shioda Sensei. We went to sit in the back row of the guest seats. Ueshiba Sensei was sitting on the stage with people like Kisshomaru Sensei, Osawa Sensei and Tohei Sensei beside him. Ueshiba Sensei happened to see Shioda Sensei sitting in the guest seats and said to him: “Shioda, why are you sitting there? Come over here!” He immediately let Shioda Sensei sit next to him. Ueshiba Sensei had the top Aikikai teachers move over to make a seat for Shioda Sensei and me, as his students, were very proud. I naturally thought that he as the head of the Yoshinkan was different. 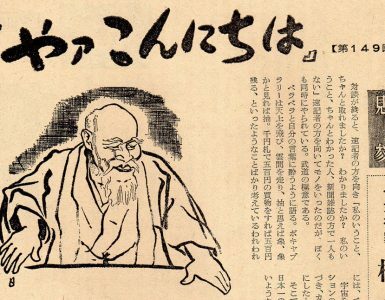 The rumors running around at that time were that Shioda of the Yoshinkan was a man who rebelled against the Ueshiba family, that his practice method was a century old, that his art was not aiki and, consequently, that Ueshiba Sensei was angry with him. The Yoshinkan did not actually separate from the Aikikai. In those days there were many left homeless by the war living in the Aikikai dojo. The dojo was barely operating. Thus Shioda Sensei was among the first to significantly contribute to the postwar development of aikido. I think that the establishment of the Yoshinkan served as a good stimulus for the Aikikai. At that time were there any kata for the basic techniques like you have now? Yes, there were. 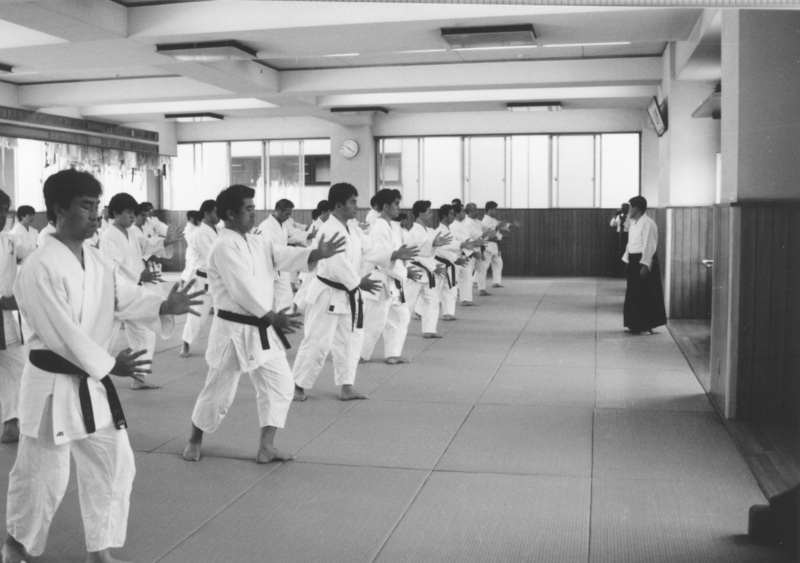 Practice at Yoshinkan is conducted following commands. When we became trainee instructors I went to teach the Youth Education Corps of the self-defense force which is headquartered in Kinugasa in Yokosuka City. When I taught them “tai no henko” (body turning exercise), one of the young men asked me something like, “Sir, how many degrees should we open our legs?” or “What percentage of weight should be shifted forward over our centers?” (Laughter). I didn’t have any answer for him but I had to say something. I responded: “There is no exact degree or percentage involved since everything changes depending on the amount of power of the opponent.” I then demonstrated several examples. I talked my way out of it like that. It was around then that the trainee instructor system was established. It was suggested that some basic forms should be established to teach future groups in order to deal with questions posed during seminars. They fixed the degree of turn of tai no henko, the practice method of “hiriki no yosei” (development of joint power) and various technical points and developed the system of verbal commands. We began to teach techniques breaking them down into component parts and using commands in 1955 or 56. It may be that the use of such methods led to the success of the Yoshinkan. Yes. You can still teach a large number of people with a few instructors. As students practice in one-two-three fashion they begin to understand techniques. So when you tell them to do all of the parts of the movement from beginning to end they can execute complete techniques. Although practicing in this way helps students to learn faster and more thoroughly, the problem is that the techniques themselves become stiff. There are no flowing movements. Since we want to avoid this we have those above 1st dan practice free techniques. 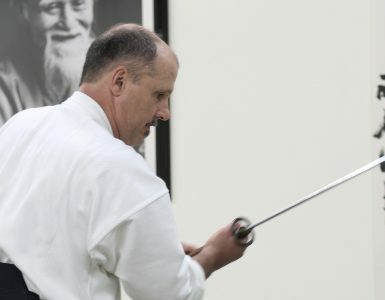 So for tests the lower kyu levels are allowed to execute techniques in a one-two-three manner but those of the shodan level have to do free techniques. We check to see if they are leading the attacker and moving and turning properly. Would you relate some of the old episodes you have heard from Shioda Sensei? I heard such stories between breaks in practice or when we traveled for demonstrations. We heard a lot about Ueshiba Sensei too. Shioda Sensei told us that O-Sensei would often carry an iron fan on the train when he went to give a demonstration. He would say to Shioda Sensei handing him the fan, “Shioda, strike my head whenever you find any opening!” Then he would begin to doze off. Shioda Sensei waited thinking that if he tried to strike him right after Sensei began to doze off, O-Sensei would know it. Then when he thought that the time to try had arrived, O-Sensei would suddenly wake up and ask, “Have we reached the station yet?” (Laughter) When Shioda Sensei hid the iron fan replying that they hadn’t yet arrived O-Sensei would say, “Oh, is that so?” and then doze off again. Then Shioda Sensei pretended he was looking outside while glancing over at O-Sensei. Finally, Shioda Sensei thought the time had arrived since O-Sensei looked fast asleep. But the moment he was thinking that, O-Sensei opened his eyes and said: “Gee, I’m thirsty.” (Laughter) The same cycle was repeated about three times but Shioda Sensei began to feel ridiculous and put the fan down since he had been making an effort to stay awake. Later when Shioda Sensei asked Ueshiba Sensei if he could tell when he was going to strike him, he apparently responded that he had woken up because he felt a funny feeling. It seemed that O-Sensei did not have the feeling of being attacked by an opponent. However, for the person attempting to attack him, O-Sensei seemed to have read his mind. It may have to some extent have been good training for Ueshiba Sensei, don’t you think? 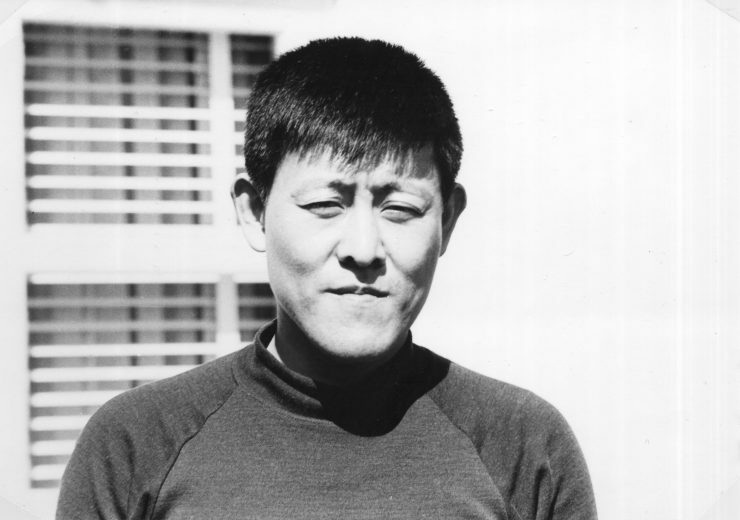 Did you ever hear any stories about Tsutomu Yukawa? I have heard some. I understood he was a really strong man. I heard that he lifted up straw rice-bags with ease. However, when Ueshiba Sensei arm-wrestled with him he had no trouble beating Yukawa. It is not power which is important. Yukawa held a high rank in judo if I remember correctly. One day a man who had perhaps a 5th dan in judo came to the dojo and Yukawa was told to practice with him. He was stopped by the man in the middle of the technique. Then a junior high school student named Zenzaburo Akazawa came up to them, took the hand of the big man and threw him. O-Sensei came up to Yukawa and said: “You have a lot of ability in aikido. But you cannot show your real ability because your mind is on unnecessary things like judo. Sabu-chan (Zenzaburo) could execute the technique easily because he did it with a pure mind.” After that Yukawa could execute shihonage properly on the same man. We would like to ask you about episodes involving Shioda Sensei himself. There are various things I want to mention about Shioda Sensei too. When I was a trainee instructor I still doubted somewhere in my mind if aikido would really work. Whenever Sensei had guests he would give demonstrations for them and one time while he was demonstrating I was taking falls in a “two-man attack” technique. Suddenly Shioda Sensei turned his back. I wondered for a second whether I could attack him from behind and thought it would be a disaster if Sensei missed a technique. I didn’t yet have enough confidence in aikido or Shioda Sensei then. I decided I didn’t care and went to attack him. However, he suddenly disappeared. Then my legs were swept out from under me and I fell. From that time on I’ve felt that I could attack him seriously without worrying even if he is looking in another direction. Another story concerns a Yoshinkan demonstration celebrating the anniversary of the Tsukudo Hachiman Dojo. Shioda Sensei walked towards us on his way to do something. We were sitting in seiza and he walked past us and then retraced his steps. There was a trainee instructor like myself sitting next to me and when Shioda Sensei strode by he whispered in my ear, “You know, if I sweep Sensei’s leg now he may fall over.” Then after a while Shioda Sensei came back to us and said, “What? You are going to sweep my legs?” (Laughter) I believe he must have some special sense. Around the time when the Yoshinkan had just been built many kinds of people would visit the dojo. Once an American who was practicing boxing came and was talking with Shioda Sensei in the front office. He was staring down at Sensei thinking how small a man he was. After they talked about various things he asked to be allowed to test Sensei. He said it was all right and stood up. When the man adopted a stance, Sensei quickly took his free hand, the opposite of the one he was preparing to punch with. The man fell to his knees with a thud. When the boxer asked Sensei why he did nothing to control his punching hand but applied a technique on the other one, Sensei replied: “Your fist was just a feint. I knew you intended to do something with your other hand. I just controlled it, that’s all.” The man said that he was really amazed. The technique was a yonkajo applied quickly. Shioda Sensei executed it really fast. People often tell me that Shioda Sensei can execute techniques so well because we students attack him halfheartedly. It may be true. But we cannot attack him with all our strength even if we wanted to. Not being able to attack with all one’s might is to have one’s ki controlled. This is aiki too, isn’t it? We often hear of cases in the kendo world where people are beaten because of awe. A young man cannot enter easily when facing a frail old master of 80. The young one looses because he is in awe of the old master. So if those who observe your demonstration say that what you are doing is a put-up job, you shouldn’t really care because it is true that you cannot attack with all your might. Shioda Sensei always tells us that when he tries to give his best demonstration his uke should take their best falls. There was no better training for me than taking falls for Sensei. You don’t know what he will do to you at a demonstration. There is no agreement among us, you know. When did you begin teaching the police? The riot police began to practice aikido in 1960. I sometimes accompanied Shioda Sensei around that time. We taught the riot police then on a part-time basis. Then in 1967 policewomen started training at the Metropolitan Police School. I was a part-time instructor at the school at that point. Then in 1970 the number of policewomen increased greatly and they were all required to live in the school dormitory. The metropolitan police requested us to send a full-time instructor. Shioda Sensei suggested that I take the job. That was on December 1, 1970. That’s how I came to teach a general culture course in aikido at the police school. Do you teach any special techniques to the female officers? I teach the basic techniques of aikido without altering them in any way. In addition I teach applied self-defense techniques. I also instruct them in methods to subdue attacks without executing techniques. It is difficult since I have to teach aikido as an art designed to be specifically useful for policewomen. I don’t teach many seated techniques because they mostly stand. The reason is that when they are working outside they don’t sit. We divide these techniques into seven situations to cover grabs from the front, strikes and rear attacks. We have the students practice them as basic techniques. After practicing these we move onto 150 basic techniques. When they reach the shodan level we teach them seated techniques. We also teach them such techniques as two-person and multiple attacks. Have you had any particular difficulties teaching policewomen? Women don’t like to be treated like women when training. But they don’t want to be treated as severely as men are either. That is the difficult point. We have to understand well that men and women have equal rights but are different in nature. Both sexes should be treated with the same strictness. The important thing is the content. Women have strengths which men don’t have and men strengths that women don’t have. You can’t try to change this. Men practice vigorously but do not last long and their powers of concentration are not as high. On the other hand, women do not have the same physical power in practice but have better stamina. How do you deal with students who have practiced different styles of aikido before entering the school? Since the style taught to the metropolitan police is after all the Yoshinkan method I gradually adjust their techniques. However, I cannot tell them to discard the things they have learned so I tell them to make the most of them. 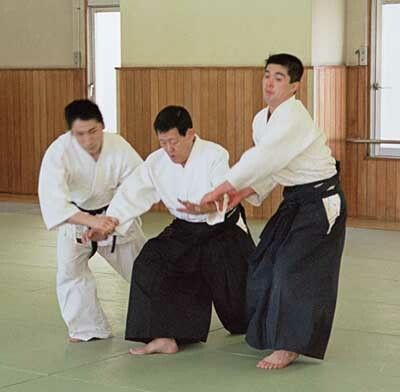 There are various people who have trained in the Aikikai style or Takeda school and so on. 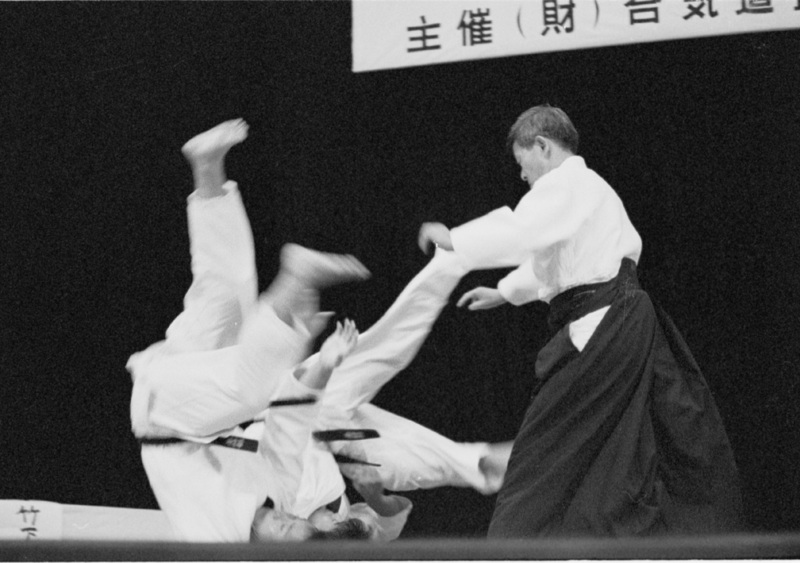 Those who have practiced at the Aikikai are good at flowing movements. A policewoman who won second place in last year’s demonstration used to practice a different style. In the beginning she couldn’t do the techniques well and would cry when she practiced. But she tried her best and mastered the basic Yoshinkan techniques and came in second. Since there is no competition in aikido, encouragement is important. So we thought up a way of holding aikido demonstrations as contests and began to use this system six years ago with the permission of Shioda Sensei. The techniques of the students have greatly improved ever since then. In individual contests the student is required to execute free techniques against frontal attacks, thrusts, etc. The uke is required not to resist but to take correct falls. There is no agreement on how to attack the demonstrator. She can attack using shomenuchi, yokomenuchi or any way. We use a low-point scoring method, that is, we take points away from the 30 points. They demonstrate for 40 seconds and then the demonstrator and uke change roles and continue in the same way. We decide the winner through this tournament system. The result of their daily practice shows up at the contest, doesn’t it? That’s right. Since no agreement is made between the demonstrator and uke on what techniques they are going to do, there are sometimes those who end up bleeding after cutting themselves or crashing into one another. You can’t win first place without demonstrating about seven times in the contest. As you continue to win, you have a shorter break and so you need stamina for that. All sorts of things are involved to keep winning such as good techniques, strength and good manners. Since we adopted this contest system, the techniques of the students have improved a great deal. They become able to use techniques without hesitation when they need them. They are not “kata” anymore but live techniques. Therefore, they can take a fall even if they are thrown with a technique they don’t know at all. It is a good study for both the demonstrator and uke. If a classical-type competition system were introduced, the art would become something which is totally different from aikido. In our system you are required to execute a technique without resisting the attacker’s power but using it instead. The important thing is that you display the maximum effectiveness with the minimum power.